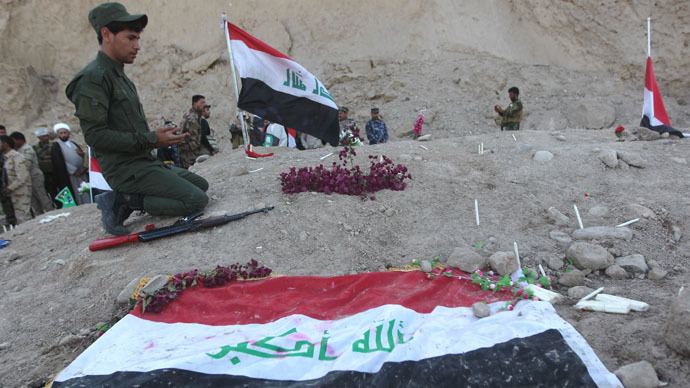 Iraqi forensic experts are exhuming mass graves of soldiers believed to have been killed by Islamic State militants in the newly liberated city of Tikrit. In June 2014, militants from Islamic State (also known as ISIS, or ISIL) launched a surprise attack on Camp Speicher, a former US Army base, where hundreds of captured Iraqi soldiers were summarily executed following a month-long siege. Forensics experts started the exhumations on Monday and have concentrated their efforts on eight locations inside Tikrit's complex of presidential palaces, where the killings are believed to have occurred, Kamil Amin, from Iraq's Human Rights Ministry, told the Associated Press on Tuesday. "The work is continuing and we expect to discover more mass graves in different areas," Amin said. "We expect huge number of bodies to be unearthed." Experts will conduct DNA testing to identify the bodies, but already it appears that the graves are those of the Iraqi soldiers who fought against ISIS last year. "We dug up the first mass grave site today. Initial indications show indisputably that they were from the Speicher victims," Khalid al-Atbi, an Iraqi health official working with the forensic team, told Reuters on Monday. "It was a heartbreaking scene. We couldn't prevent ourselves from breaking down in tears. What savage barbarian could kill 1,700 persons in cold blood?" Shia militias, who launched the military operation to take back Tikrit on March 2, have vowed to avenge the killings of the Iraqi soldiers. It is now anticipated that the Iraqi army move on ISIS-controlled Mosul, 225km (335 miles) north along the Tigris river, which is ISIS’s most vital stronghold in Iraq.